Cigar Rewards is our way of thanking our loyal guests for choosing Thompson Cigar. As a member, you’ll be treated and rewarded with exclusive offers sent to you via email and mail. The program is free; simply shop like you always do — and get rewarded for it. It’s about rewarding and thanking our valued customers like YOU. First Opt in to join! Then when checking out online, be sure you sign in with your username and password. Always make sure you’re logged in before you check out, and your qualifying purchases will automatically be credited to your member account. You earn 1 point for every $1 you spend on qualifying items. Platinum members earn 1.25 points for every $1 — that’s 25 percent more. - Earn 1 point for every $1 you spend. - Earn points on any qualifying product purchased at Thompsoncigar.com (Excludes purchases of gift cards, machine made cigars, redemption of merchandise vouchers, and any type of price adjustments, including merchandise returns, use of cigar reward cards are not eligible for points). - Redeem points as soon as you have 100 on any of our thousands of products at Thompsoncigar.com. - Receive member-exclusive email offers and extra bonus points. - Get invited to member-exclusive online events. - View your points balance online on your account. - Check out the "Earning Points" and "Redeeming Points" sections of these FAQs to learn more. Is Cigar Rewards a credit card? No. Cigar Rewards is a free program that offers you benefits for your love of cigars. It’s that simple! 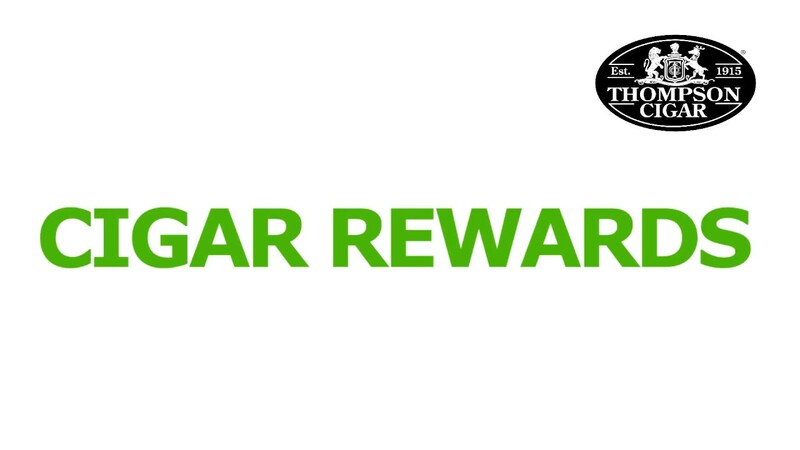 Earn points every time you shop at Thompson Cigar and redeem points for discounts on any of our thousands of products. No — enrollment in the Cigar Rewards program is FREE. Make sure you have opted in and that you’re logged in when you make a qualifying purchase. Your points will be added to your member account automatically when your qualifying items have shipped. Members earn 1 point for every $1 spent on qualifying purchases. Platinum members earn 1.25 points for every $1 spent on qualifying purchases. - Online purchases, points will be credited to your account within 72 hours after your order has shipped. You can earn points on all thousands of our our products. However, machine made, gift cards, shipping charges, discounts from marketing coupons (or other similar discount coupons), auction orders, taxes, and fees are not eligible for points. Can I earn base and bonus points on the same item/transaction? Yes, members can earn base and bonus points on the same product/transaction. For example, members will earn 100 base points on a $100 qualifying purchase. If a "2X" multiplier offer is also applicable, the total points earned would be 200 (calculated as follows: 100 base points + 100 bonus points = 200 points). Say hello to points galore! Can bonus points offers be combined? On select offers, Cigar Rewards may also offer a chance to combine two or more bonus offers on a qualifying purchase. Please review the terms and conditions of your offers. You’ll find the terms and conditions on your email offers and during checkout. Points expire 15 months after the month they were earned. Example: Points earned in January 2016 will expire 4/30/17. You can find the current number of points expiring in your account. Do Platinum members earn points differently? Yes, Platinum members earn 1.25 points per $1 spent (i.e., 25 percent faster). No, the Cigar Rewards account is individual and non-transferable. To check your points balance and your bonus point offers online, go to the My Rewards page. Why do I need to activate my membership account on my online profile? I forgot my password to access the Thompsoncigar.com site. What do I do? How do I enroll in the Cigar Rewards program? - If you do not have a Thompsoncigar.com online account: Click "Sign in" then Click "Create an Account". Follow the steps to create an online account and check, Yes, I want to earn rewards. This will opt you in to join our Cigar Rewards program.- If you have a Thompsoncigar.com online account: Log in to your account and during checkout on the Order Review and Summary page in the summary box check Sign up & Earn points now! Are there membership levels in the Cigar Rewards program? Yes. Once you spend $400 in a calendar year (excluding taxes, shipping and merchandise discounts), you will be upgraded to Platinum Status. We know you’ll love all the perks and privileges. You must be at least 21 years old to enroll in the program. My family has more than one Thompson Cigar shopper. Can we have additional Cigar Rewards memberships? Yes, every family member can have one membership. Just remember that memberships cannot be combined. - To check your Cigar Rewards point balance, simply go to Thompsoncigar.com and sign in to your online. Once you are logged in, click on the MY REWARDS link to view your points. Make sure you are logged into Thompsoncigar.com. When you finish adding all products to your cart, proceed to checkout and provide your shipping information. When you get to the payment page, find the field where you can select how many points you want to redeem. Make your selection and proceed through checkout. Can I use my points with other discounts and specials offered by Thompsoncigar.com? Yes, your points can be combined with other discounts and special offers, as well as any form of payment accepted at Thompsoncigar.com. If you use your rewards points to buy an item and then return that item, you will receive only what you paid in cash plus the points you redeemed back to use on a future purchase. If you originally purchased more than one item in your redemption transaction, you will receive a portion of the points back. (Points are allocated evenly between the number of items in the order and the total number of points in each order). No, points are not transferable. By providing us with a valid email address, you agree to the Programs terms and conditions and you will receive key program benefits such as bonus point promotions and other fabulous offers that are only available via email. Platinum status is a higher level of Cigar Rewards with extra-special perks that we use to reward our best members. How do I qualify for Platinum status? Reaching Platinum status requires a minimum annual spending of $400 (total qualified spending between January and December of a calendar year). Your membership will be upgraded automatically once you meet the annual spending threshold. How do I find out about my Platinum membership level? What are the benefits of being a Platinum member? - Earn points 25% faster. (1.25 points per $1 spent)- More bonus points- Exclusive offers and events- When do my benefits begin? Your benefits begin immediately after you qualify for Platinum status. How long do I keep my Platinum membership? When you become a Platinum member, you will keep your status until December 31 of the following year. You will need to re-qualify every year to extend your Platinum status. What is the qualification period for Platinum status? How much does it cost to be a Platinum member? Nothing. It’s free! Spend $400 in a calendar year and you’ll be upgraded to Platinum status. Does Cigar Rewards apply to Auction orders & Machine Made cigars? Cigar Rewards points cannot be earned or redeemed on Thompson Cigar Auction orders. Cigar Rewards points cannot be earned on Machine Made cigars as of July 1, 2017.